0.44 lbs./0.20 kg to 33.70 lbs./15.29 kg capacities plus streamlined cup for UBE ladlers. Heavy duty, quality controlled cast iron, produced in our own foundry. Contours designed for smooth pouring. 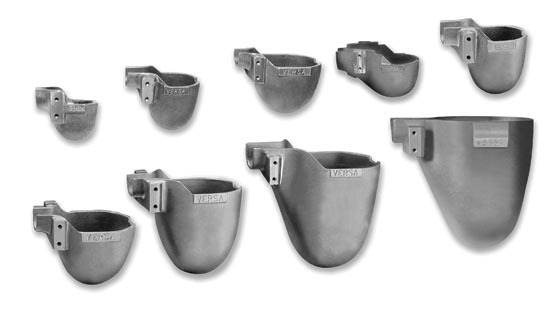 Cups combine efficient design for fast, easy replacement on right or left hand applications. Money-saving patented mounting system allows the re-use of mounting hanger components for optimal right or left hand use. Universal Cups fit most die cast casting automated ladlers with easy hanger change. Unique design minimizes aluminum build-up and premature cup replacement. 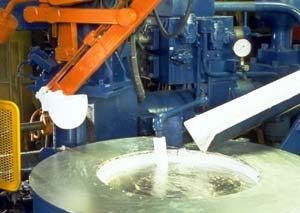 Textured cast surface is excellent for ladle coating adherence. Hanger can be attached to either side of cup for left or right uses. Extra thick quarter-inch wall for longer life. 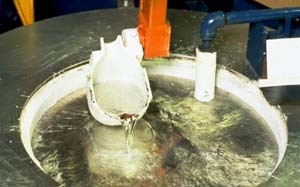 Ladle Cup pivots on spout which maintains consistent metal flow. Allows direct sleeve pour.